Paint the "hats" with pastel colors, one coat is usually enough, and allow them to dry completely. Once they are dry you can embellish them with small silk flowers, pretty beads, and ribbons using a hot glue gun. 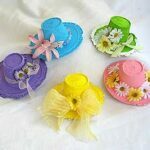 This project for Styrofoam Cup Spring Bonnets was printed from CraftsbyAmanda.com - https://craftsbyamanda.com/styrofoam-cup-spring-bonnets/ and can only be printed for education or personal use.